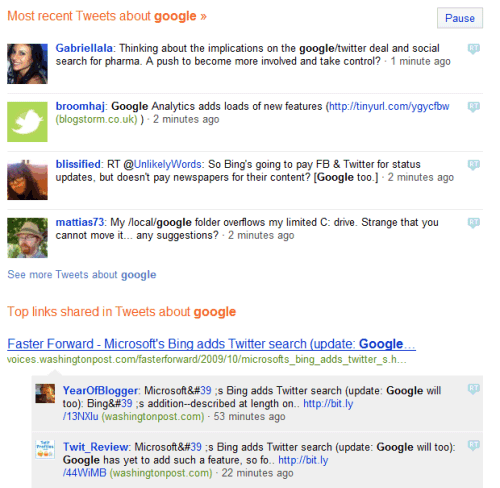 I posted in June that Google prepares a search engine for microblogging services like Twiiter. A Google blog post announces that Google has "reached an agreement with Twitter to include their updates in the search results". Real-time results from Twitter will probably included in a special OneBox triggered by keywords that are suddenly popular in Twitter. "We believe that our search results and user experience will greatly benefit from the inclusion of this up-to-the-minute data, and we look forward to having a product that showcases how tweets can make search better in the coming months. That way, the next time you search for something that can be aided by a real-time observation, say, snow conditions at your favorite ski resort, you'll find tweets from other users who are there and sharing the latest and greatest information," explains Marissa Mayer. The most difficult problem that Google has to solve is ranking tweets, as most microblogging search engines sort the results by date and aren't able to filter spam and irrelevant results. Twitter's blog explains why the company co-founded by two ex-Googlers partnered with Google. "Our friends down in Mountain View want to organize the world's information and make it universally accessible and useful. A fast growing amount of information is coursing through Twitter very quickly, and we want there to be many ways to access that information. As part of that effort, we've partnered with Google to index the entire world of public tweets as fast as possible and present them to their users in an organized and relevant fashion." In the meantime, Bing has released a Twitter search engine that sorts the results by date and highlights the top links shared by Twitter users. Why does Google pay money for indexing the publicly available Twitter data? Twitter's API is rate limited. Thanks! I guess Google cannot crawl through the Twitter site to get that information, like it does with e.g. news sites (even the ones that don't agree to it)? Google can index the pages from twitter.com, but it's hard to do that in real-time without relying on an API or a protocol like pubsubhubbub. Bing Twitter is not available in Singapore locale. I can't believe how popular Twitter has become. This is a dream come true for me. Index all tweets ever. Index all real time tweets. And then help make sense. The Bing Twitter search engine Sux!!! !